Hi everyone and happy Sunday! The birthday party yesterday was a success....well, other than some drama over the pinata apparently not having enough candy in it, lol! Today we're just taking it easy. Parties are exhausting, aren't they?....FUN, but exhausting. Anyhooo....enough babble and onto my card. It's actually the second one I made today because I hosed the first one with a big ink spot (arghhhh!) when it was all done. 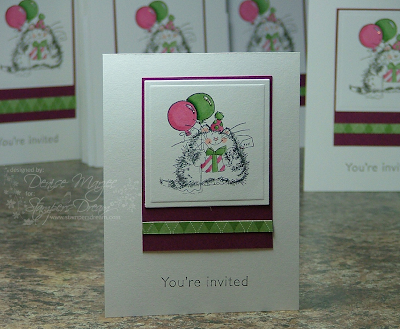 The stamps are from my Hero Arts Cuckoo clear set from Stamper's Dream. They're stamped in Memento Cocoa and I added some Stickles to the grass and flowers in the clock. The polka dot panel is up on foam tape. The DP is Farm Fresh by October Afternoon and the blue panel is Prism Baby Blue Light. The green flower was made with a Spellbinders die and I added a Chocolate Kaiser Craft Pearl to the center. Hope you're having a very relaxing day! Hi all! I'm still plugging away at getting ready for all the birthday festivities this weekend, but after several days of no stamping...well....I was jonesin' to stamp and determined to do it today! 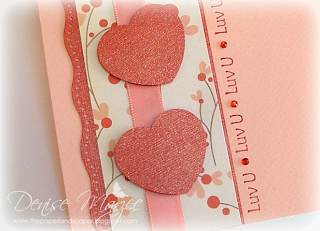 I made this card for today's Valentine Love Challenge on the JustRite Stampers blog. 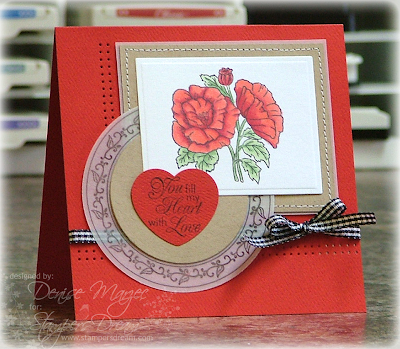 The poppies and circle border are from my Plant a Little Love set, and the sentiment is from my Loving Thoughts set. 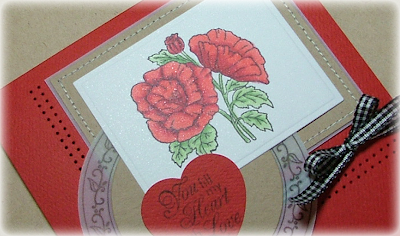 The poppies are stamped on Cryogen White and the card base is Spirit Red Feltweave. Both are available at Paper Temptress. Good morning! I got a chance to play along in a few challenges this morning (fun!). The colors are from Betty's Color Challenge on SCS (blush blossom, melon mambo, pretty in pink), the layout is Mercy's Sketch, and I used things beginning with the letter P for the Timeless Tuesday Challenge. I used pearls on the i's in the sentiment, a wavy dot punch, pink CS and pink Copics, and fruit punch stickles. 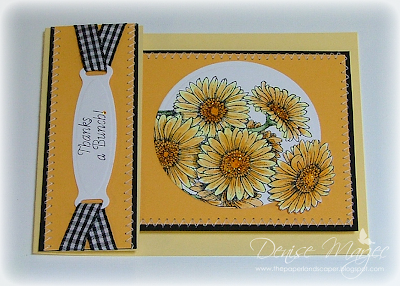 For this card I used a couple new JustRite stamps, My Garden Borders & Centers and Just a Note Borders & Centers. The yellow circle is up on foam tape and I added mini rhinestones to the sentiment and yellow panel. All the stamping was done with Memento Cocoa ink. The layout is Karen's Sweet Sunday Sketch. Hey all! I just got home from work and picking up party supplies....balloons, plates, cups, party favors, bags, candy, pinata, etc.....oye, that stuff adds up! Here's a card I made for Cindy's CCEE sketch. 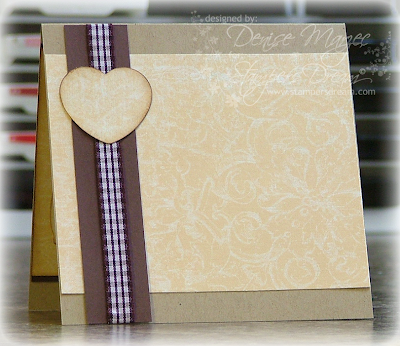 The DP and large heart with the white edging is from my Be Loved DP pack. 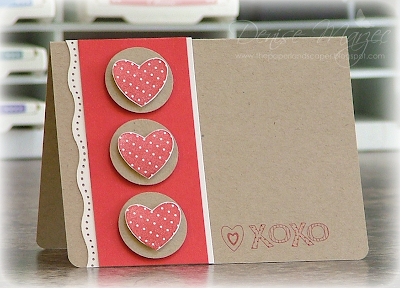 The other hearts (from my OCL Hearts & Hugs set) were stamped in Riding Hood Red and Groovy Guava inks, and they're up on foam tape. The card base is Wild Cherry Pop Tones. Hey all, happy Wednesday! Here's a card I haven't posted to my blog yet. Michelle sent me this adorable Cupid at Work image. I love it! Edited: I thought this stamp was sold out, but Michelle has ONE left. If you want it, go grab it before it sells out. Hi all! Just a quick post today because we're headed down to my Mom and Dad's. It's Dad's birthday today and this is the gift card holder I'm giving him. 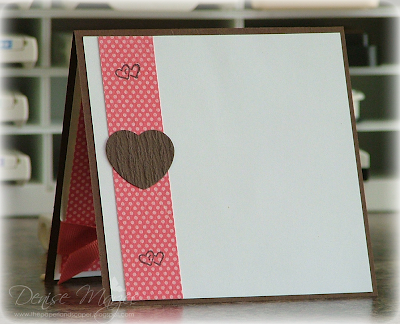 You can see the tutorial for the pop-up GC holder HERE. This is my favorite GC holder to make. Really easy and quick! 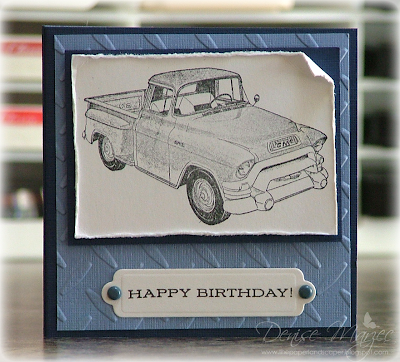 The CHF truck image and Flourishes sentiment are stamped on sparkly Cryogen White from Paper Temptress. The matted blue layer behind the truck is up on foam tape. I added some Cryogen White to the inside and embossed it with my diamond plate EF....Dad loves diamond plate! What do you think? Could this frog be Prince Naveen? LOL, I took my daughter to see Princess & The Frog last night at a second-run theater...SUCH a cute movie! When Prince Naveen wants Tiana to kiss him to turn him back into a prince, she asks, "Just one kiss?" He answers, "Just one, unless you beg for more." Hehe, cracked me up, so that's what I used for my inspiration today....that line from the movie. The layout is Karen Giron's Sweet Sunday Sketch. Hi all! I've had time to participate in a lot of challenges this week....and it feels good! 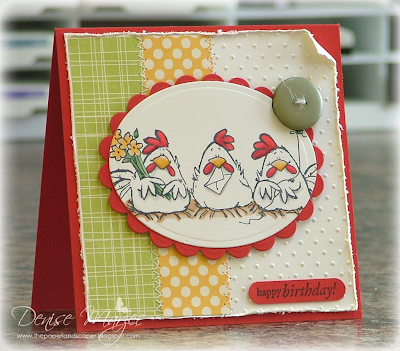 :) This card is for Cindy's CCEE Sketch and Julia's Where's the Birdie Challenge on SCS. There's some yellow-y sparkle in the Laundry Line DP that you can't see in the photo. The matted Saffron panel behind Tweetie is up on foam tape and I made the sentiment on the computer. My girl Silke is hosting a sketch challenge this week on the Flourishes blog so I just had to play! 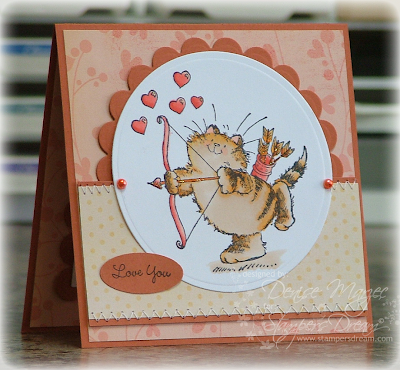 I colored up my image on Tuesday and knew I wanted to use my red crepe ruche CS (love the texture on this stuff!) 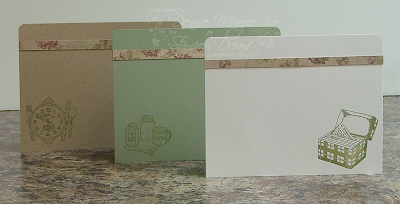 from Paper Temptress, but then I was stumped on what greens to use on the card so I let it sit. Well, LeAnne to the rescue!....yesterday's Color Throwdown colors were razzleberry, moss, and garden green...or you're allowed to use something "close" to those colors. I used the moss and garden greens, but switched out razzleberry for this red crepe color. Hey there and happy hump day! Here's a card I made for Taylor's Sketch. I used my Bubs Beaver set from OCL and paired it up with some Cocoa Ruche from Paper Temptress. I thought the ruche CS went really well with the tree image. The sentiment tag and large circle are up on foam tape. Someone asked yesterday what MME (in my supply list) stands for...It's My Mind's Eye. 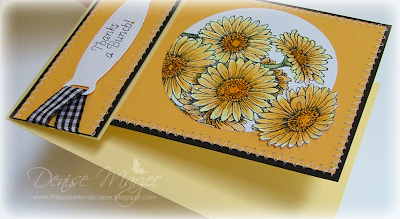 Just thought I'd mention it since I used MME paper on this card, too. JustRite Blog Hop and SALE! 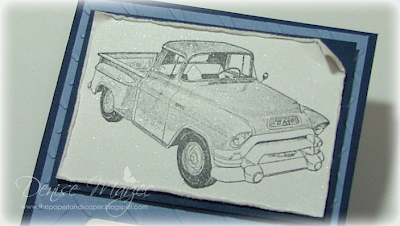 Hi everyone and welcome to our first ever blog hop at Stamper's Dream! We thought a blog hop would be a fun way to showcase the newest stamps from JustRite.....and for some extra fun, there's going to be some mystery blog candy hidden along the way. All you have to do is hop around to each blog, leave a comment everywhere to make sure you're entered, and then on Wednesday night (January 13th) the winner will be announced on Michelle's blog. Ready? Okay, first you'll want to start at the beginning of the hop, which is Tosh's post HERE. If you've come here by way of Michelle's Blog, you're right on track with the hop! 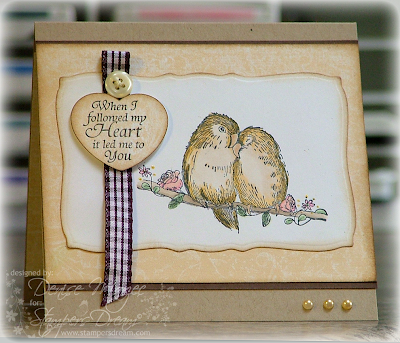 For my card, I thought I'd pair up my JustRite Romantic Sentiments with these sweet Penny Black lovebirds, called The Forever Dream. The Kaiser Craft Pearls were colored with a YR21 Copic marker. Okay, next up in the hop is Amy. Head on over and check her out! Michelle is having a ONE-DAY SALE TODAY, today until 10 p.m., on Life Stories DP, JustRite square products, Spellbinders, Whiff of Joy, and Prism Papers. Head on over and check it out! Thanks for stopping by and good luck in winning the mystery blog candy! Hey there! 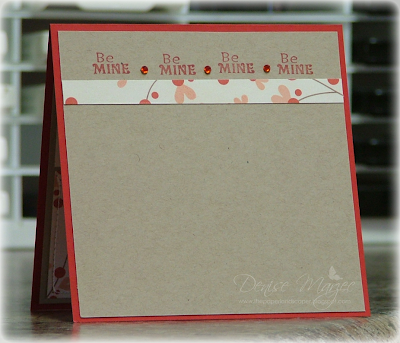 I just got this Hearts & Hugs set in the mail yesterday from Our Craft Lounge and thought it would be perfect for some CAS-style cards. 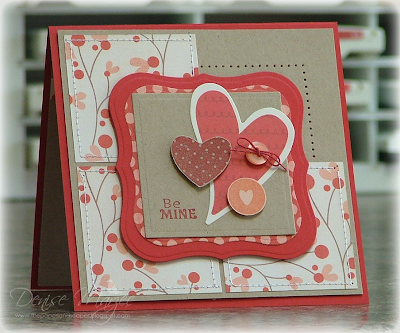 I used this layout from the Clean & Simple Blog, and the *love* theme fits into Sharon's Stamp Simply Challenge. 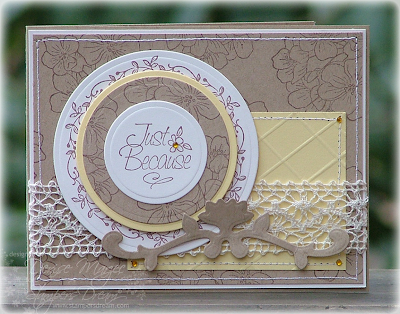 I'm also excited to announce that I'm going to guest design this month for Paper Temptress! 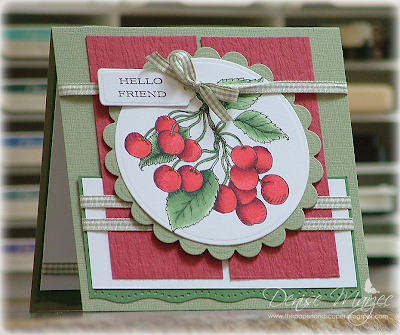 Patricia sent me a whole BUNCH of gorgeous papers to play with, so yesterday I got right to it and made these cards. This CS is textured with a heavier gold sparkle. 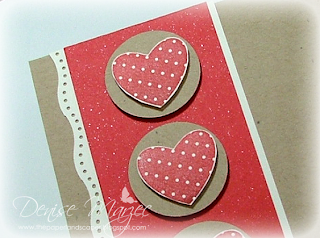 The punched hearts are up on foam tape. 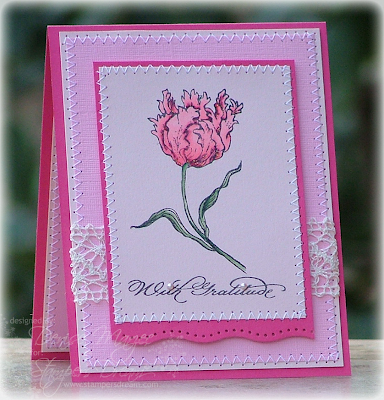 The card base is PT's Pink Double Duty, which is textured on one side and smooth on the other. Well, I jumped on the bandwagon and bought some of this Farm Fresh DP and couldn't wait to make something with it. My daughter had a snow day today, so this a.m. I promised her I'd play in the snow with her (it wasn't good snowman-making snow though...bummer! ), so after going outside for a bit and getting some hot chocolate when we came in, I went straight to my stamp table! The layout is from the CCEE girls, who just started back with challenges yesterday. I just flipped the sketch sideways. Hi everyone! 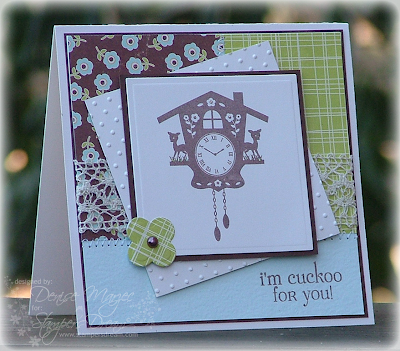 Here's a card I made for Mercy's Sketch and Maki's color challenge on the Timeless Tuesday blog. 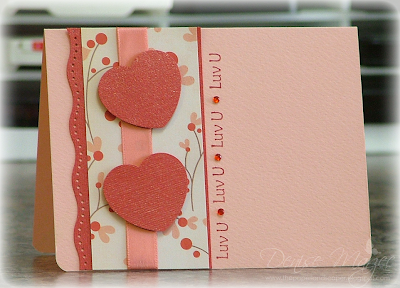 Here's a close-up so you can see the funky fold/cut that I gave the card. Not sure I love what I did here, but hey, what's done is done, lol! See that cool inner glow on my photos? I've always wanted to do this, but I wasn't sure HOW to do it in Photoshop. Well, Amy Sheffer has a post in the MFT Forum on SCS outlining all sorts of photography tips....including how to add this Inner Glow! Thanks again, Amy! You so R-O-C-K! 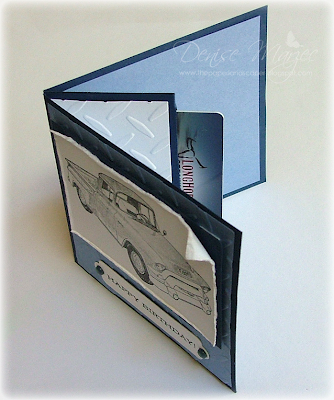 Check out this super COOL new arrival at Stamper's Dream....Cardkeeper Album Kits! 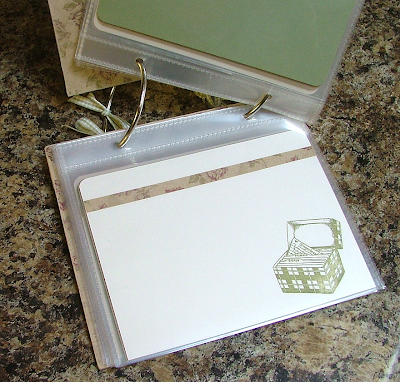 You can use them to store just about anything.....A2-sized greeting cards, recipe cards, photos, etc. I wanted to make a recipe book for my Mom in her kitchen colors (hunter green, ivory, and beige with some burgundy). I altered the covers and the Maya Road What's Cookin' Mini Chipboard pieces with some Life Stories DP Collection 2 DP. 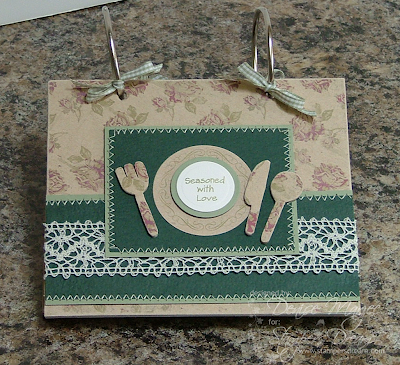 I used my chipboard pieces, Spellbinders circle dies, JustRite Decorative Wide Border, Cookin' Up Memories set, and some Prism Sage Dark to make a "place setting" on the cover. Now...here's my FAVORITE part about these Album Kits. I've mentioned in other posts how I like to put my recipe cards in clear protectors so they don't get messy splatters while I'm cooking. Well, these kits include sleeves! Michelle also has the Cardkeeper Sleeves in her store that you can purchase separately if you'd like to have extras on hand. Have to say, these sleeves by Cardkeepers are MUCH better quality than the ones I've been using in my old binder. They're thicker and won't "tear" while you're flipping through the cards. This book I made for my Mom has a total of 15 sheet protectors in it.....and there's room for LOTS more! Here are the recipe cards. I made five of each color. The Cookin' Up Memories images are stamped in Versamagic Olive Chalk Ink. Our daughter's birthday is coming up so I made some party invitations with my Penny Black Bubbly clear set. I wanted to keep the invitations really simple and light since I had to make a bunch of them and so I wouldn't have to add extra postage. These are as simple as they get....just coloring, a DP strip, and some Stickles on the balloons and gift tag. They're A2-sized card fronts and then I have all the party info on the back. 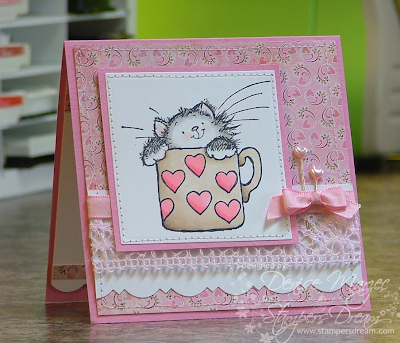 Penny Black stamps, Memento Inks, and Stickles are available at Stamper's Dream. 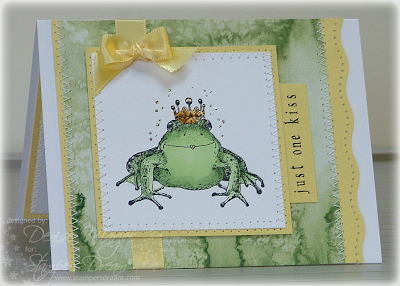 To celebrate, Michelle is having a sale on all Prism Paper and Spellbinders dies...and don't forget that the newest JustRite Stampers release is on sale as well. Michelle sent me this sweet little Brimming with Love image and I couldn't wait to color it up. So adorable! The card base is Prism Razzleberry Light (on sale right now). 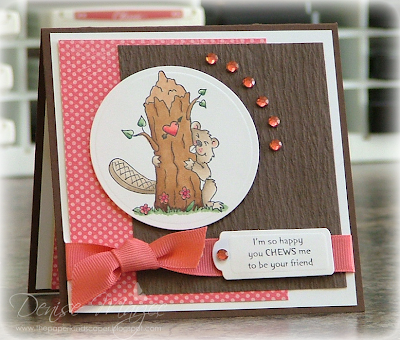 The layout is Karen's Sweet Sunday sketch #50. The pink crochet ribbon is also available at Stamper's Dream. Here's the inside where I used a sentiment from my JustRite Tiny Words set. I wish you all an amazing, happy and healthy 2010!